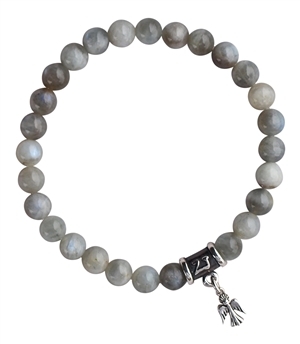 Take some time to enjoy the pure energy of our Sea Foam Moonstone bracelet and experience solace for your soul! Emotionally, Moonstone soothes emotional instability and stress, and stabilizes the emotions. It improves emotional intelligence. Placed on the solar plexus (chakra 3 - Manipura), it draws out old emotional patterning so that it can be understood and then dissolved. Moonstone provides deep emotional healing and heals disorders of the upper digestive tract that are related to emotional stress. Give this rare gem a try & begin healing today!